The statements imply a correlation between gold and interest rates. And the implied correlation suggests that higher interest rates result in lower gold prices. If that is the case, then there should be some historical precedent to corroborate the correlation. There is. And we only need to go back a few years or more to find it. But it does not corroborate the correlation; it refutes it. During the ten-year period 2001-2011, gold’s price increased from $275.00 per ounce to a high of nearly $1900.00 per ounce. And interest rates continued their long-term decline throughout that entire period. In this example the original correlation is inferred to be supported by the opposite scenario – lower interest rates and higher gold prices. So far, so good. However, let’s go back a bit further along the time line. Between 1970 and 1980, the price of gold increased from $35.00 per ounce to $850.00 per ounce. But rather than declining, interest rates were on a tear. Rather than “struggling to compete” gold was galloping ahead in the face of ever higher interest rates and increasing lack of demand for higher-yielding investments. Two ten-year periods of outsized gains in the price of gold. And interest rates were doing something exactly opposite during each period. There simply is no correlation between gold and interest rates. Additionally, there is no correlation between gold and 1) social unrest, or 2) global terrorism; or 3) world wars. Gold is not a safe haven hedge and it is not an investment. It is real money. But is there something that correlates with gold? Anything at all? Why does its price change? And so dramatically, it seems? With respect to gold and its price changes, there is only one thing that correlates. The U.S. dollar. The U.S dollar is a substitute for gold. Gold is original money. The price of gold is an inverse reflection of the changing value of the U.S. dollar. The ongoing, never-ending deterioration of the dollar’s value means ever rising gold prices over time. Gold is the standard; not the U.S. dollar. Gold has earned its designation as real money over five thousand years of history. It is original money. And it is real money because it is a store of value. And there is historical evidence to support the correlation of gold’s price to the value of the U.S. dollar. Every change of significance in time and price for gold correlates with an inverse change in the value of the U.S. dollar. Higher prices for gold correlate with a lower value for the U.S. dollar. Lower gold prices correlate with stability and strength for the U.S. dollar. The correlation between gold and the U.S. dollar is implicit. One does not ’cause’ the other. Either one is the inverse of the other. Some have said that the argument about correlation of interest rates and gold depends on making a distinction between real interest rates and nominal interest rates. No correlation there, either. That is because any patterns that appear to confirm correlation between real or nominal interest rates and gold need to include the U.S. dollar. The U.S. dollar is the determining correlative factor re: gold. Without taking into account the relative strength or weakness of the U.S. dollar relative to gold’s price, any other correlations are either meaningless, misleading, or contradictory. There are six major turning points (1920, 1934, 1971, 1980, 2001, 2011) on the chart below. All of them coincided with – and reflect – inversely correlated turning points in the value of the U.S. dollar. The U.S. dollar is the world’s reserve currency and gold trades are settled in U.S. dollars. 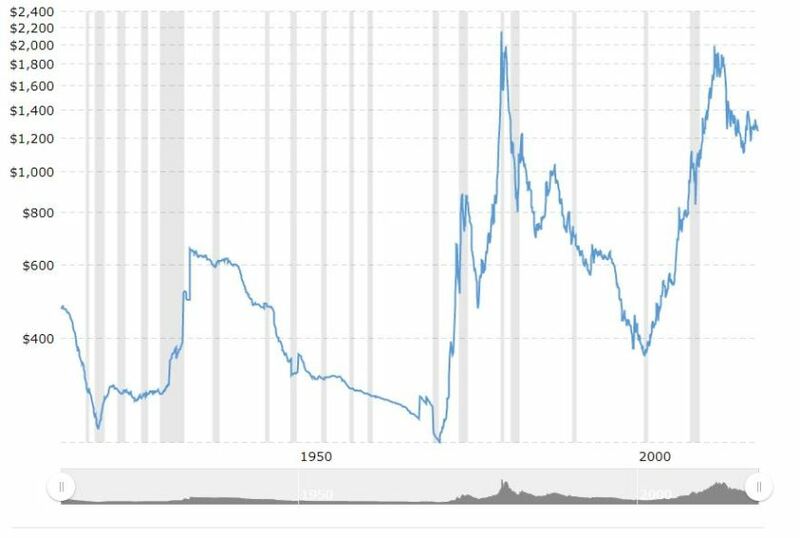 Since gold is priced in U.S. dollars and since the U.S. dollar is in a state of perpetual decline, the U.S. dollar price of gold will continue to rise over time.